Three months after it opened, Tampa Bay&apos;s Ulele restaurant has made Open Table&apos;s list of the Top 100 restaurants in the country. The Gonzmart family, owners of Tampa Bay&apos;s iconic Columbia Restaurant in Ybor City, created a new icon when they opened Ulele in the City of Tampa&apos;s 105-year-old former Water Works building, which housed the machinery to pump water to the growing city from the nearby spring. The Gonzmarts invested millions in restoring the historic brick building and creating a restaurant inspired by native Florida foodstuffs. It even includes its own in-house microbrewery. The restaurant sits just in Tampa&apos;s up-and-coming Tampa Heights neighborhood at 7th Avenue and Highland Avenue, just north of downtown. It&apos;s adjacent to the city&apos;s newest park, Water Works Park, which has gorgeous views of the Hillsborough River. The restored Ulele Spring connects to the river and offers a haven to passing manatees. Open Table made its list based on feedback collected from Open Table clients between Dec. 1, 2013, and Nov. 30, 2014. The winners received the 100 highest scores. The list includes restaurants in 32 states and Washington, D.C. New York has the greatest number of winners with 12; California and Florida had eight each. Ulele is the only Tampa Bay restaurant. 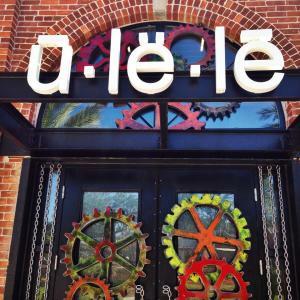 Ulele is named for the daughter of a legendary Native American chief. The restaurant and Ulele Spring Brewery serve unique foods and spirits by fusing elements from a rich variety of Native American and multicultural influences, including those of European explorers. The menu features items indigenous to this area’s waters and farms. The restaurant is open daily, serving lunch and dinner. The menu includes vegetarian and seafood options. But IMHO, its star attractions are the oysters, served every way from raw to roasted, and the dessert that combines the six best words in the English language: candied duck bacon maple fried ice cream.